The Red Kangaroo is the Northern Territory Animal Emblem. They are the most well known of our Australian animals. The Red Roo is the largest of all the Kangaroos, it is also the largest mammal that is native to Australia, and the world's largest surviving marsupial. The male has a red brown fur. The females are a bluish grey. In the more arid parts of Australia the females may be coloured more like the males. The males can be up to 2 metres tall and weigh up to 90 kilograms. The females are quite a bit smaller, with an average weight around 26 kilograms. They are the only large animals that hop to move. 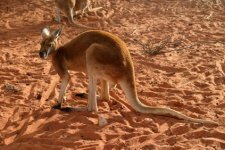 Red Roos hop at about 20 to 25 kilometres per hour, but over short distances they can reach speeds of up to 70 kilometres per hour. They are nocturnal and active at dawn and dusk, they spend most of the daylight hours sleeping or resting. They are found in groups of between a few dozen and hundreds, these are called 'mobs'. These mobs are made up mainly of females and their offspring, with a dominant male and a few younger males. They eat grasses, flowering plants and other vegetation. They can go for long periods of time without water by eating plants that contain moisture. They concentrate their urine to conserve water so they can withstand severe dehydration. They adjust their body temperature by panting and licking their forearms. Adult male Red Roos will often fight or 'box' each other when they are breeding, They will stand up on their hind limbs and try to get their opponent off balance by jabbing him or grabbing him and locking forearms. They will kick their opponent with their back legs while they use their tail to support their weight. Breeding time can be any time of the year. And females can have 3 young in varying stages of development. Gestation period is around 33 days, after which the hairless and sightless tiny Joey leaves the birth canal and unassisted claws its way to the pouch and attaches itself to a teat. The Joey stays attached to this teat for 120 to 130 days. The Joey leaves the pouch at around 8 months. Red Roos are found over most of central Australia.